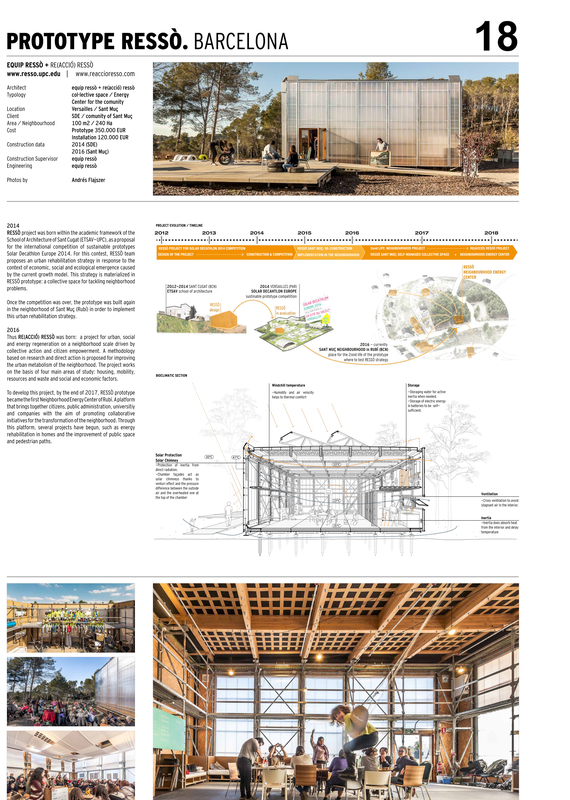 2014: RESSÒ project was born within the academic framework of the school of Architecture of sant Cugat (ETSAV-UPC), as a proposal for the international competition of sustainable prototypes solar Decathlon Europe 2014. For this contest, RESSÒ team proposes an urban rehabilitation strategy in response to the context of economic, social and ecological emergence caused by the current growth model. This strategy is materialized in RESSÒ prototype: a collective space for tackling neighbourhood problems. Once the competition was over, the prototype was built again in the neighborhood of sant Muç (Rubí) in order to implement this urban rehabilitation strategy. 2016: Thus RE(ACCIÓ) RESSÒ was born: a project for urban, social and energy regeneration on a neighborhood scale driven by collective action and citizen empowerment. A methodology based on research and direct action is proposed for improving the urban metabolism of the neighborhood. The project works on the basis of four main areas of study: housing, mobility, resources and waste and social and economic factors. To develop this project, by the end of 2017, RESSÒ prototype became the first Neighbourhood Energy Center of Rubí. A platform that brings together citizens, public administration, universitiy and companies with the aim of promoting collaborative initiatives for the transformation of the neighborhood. Through this platform, several projects have begun, such as energy rehabilitation in homes and the improvement of public space and pedestrian paths.